When something stops working you suddenly realise just how dependent you are on your computer. In today’s world the whole organisation tends to grind to a halt if the IT system stops working. 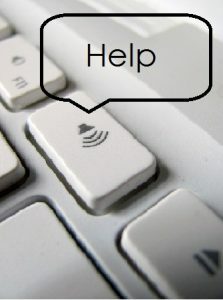 A good IT support company should reduce the problems to a minimum, but then we would say that! However, sometimes you don’t need to call out your IT support – just apply a little detective work and logic. These are some of the problems we’ve encountered recently. The computer was not obeying commands and doing things that the user had not asked it to – for instance, every time they typed ‘N’ a new document opened. We couldn’t work out what the problem was, but asked good questions and discovered they’d recently replaced the keyboard. We found the old wireless keyboard packed away in a box with the control key down still mapped to the computer. The new printer was not responding to print commands, even though the installer had put in the IP address; the server just wouldn’t recognise it. When we came in to sort the problem out, we discovered that it wasn’t configured correctly. If you change your IT hardware it’s wise to ensure there’s a joined up approach, devices on a network don’t work in isolation. A key on the keyboard stopped working. No matter how hard it was tapped – no response. The user was about to order a new keyboard, but called us and was surprised when we suggested turning his keyboard over and giving it a couple of sharp taps. The result was lots of crumbs and a keyboard that worked again! So the morale of this tale is to think about what changes have been made, or are being planned – and don’t eat lunch at your desk.